Republican presidential candidate Sen. Rand Paul, R-Ky., speaks during a campaign stop at the Republican Liberty Caucus, Friday, Oct. 9, 2015, in Nashua , N.H.
Kentucky Sen. Rand Paul is preparing to file his paperwork to run in the New Hampshire primary, capping off a busy week of candidates visiting the Statehouse. 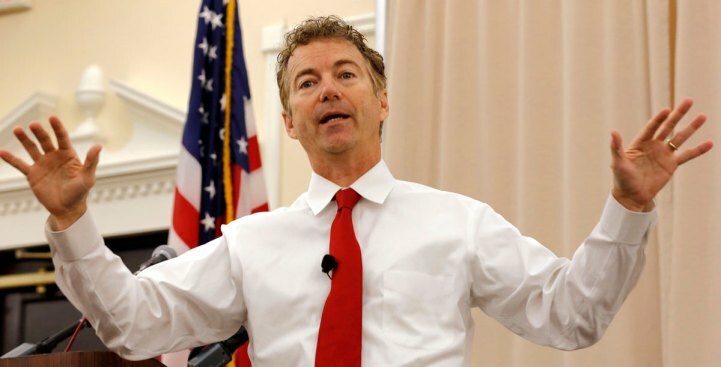 Paul will arrive in Concord just after noon on Friday to file his paperwork, and then hold a rally. Later in the evening, he'll host a town hall in Portsmouth. Candidates have until Nov. 20 to submit their paperwork and $1,000 fee to appear on the Republican or Democratic primary ballot in the state's first-in-the-nation presidential primary. Several major GOP candidates, such as former Florida Gov. Jeb Bush and retired neurosurgeon Ben Carson, have yet to file. Bush is also in the state Friday, kicking off the day with a town hall meeting in Franklin.